The demonstration task (abridged version): Write a sub procedure to add a set of new worksheets to the Workbook. … The worksheet names are in the Range name ListWS (with workbook scope) … (and) the run procedure … displays on input box with default value ListWS. The four examples are listed in this section. Only the first two (section 2.1 and 2.2) set the actual ListWS name, while the second two (section 2.3 and 2.4) set the cell reference for the name. Object property descriptions can be found at the end of this module. Line 12: Default:= =Range("ListWS").Name.Name The Name property of the Range object Range("ListWS").Name returns a Name object, then the Name property of the Name object returns a string "ListWS". See figure 1a item ① for details of the Name object, and figure 1b for the InputBox as displayed. For completeness, variations of the InputBox Default parameter with a reference Address are coded in the following sections. 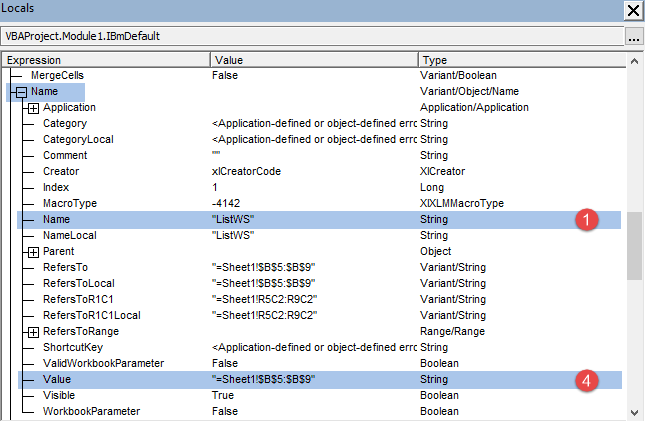 Note: the Address property Value expression is not listed in the Locals view of the Range object (figure 1a). Property expressions with arguments are excluded. In the example, code 3 displays the InputBox shown in figure 3.